The iBoot G2S web power switch is designed to be used for home and business applications. Compared to the standard iBoot G2, the iBoot G2S includes two 10/100 Ethernet ports allowing a pass thru so a single network connection can operate the iBoot unit as well as the network device it's controlling. 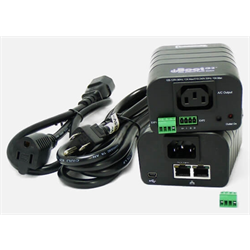 iBoot G2S provides remote power control and rebooting via power cycling from anywhere on the local LAN or over an Internet connection. iBoot lets the user manually control power, check status and remotely power cycle equipment such as routers, computers, servers, digital signage, kiosks or datacenter equipment from anywhere using a simple web interface.